Hi Creative Home readers! 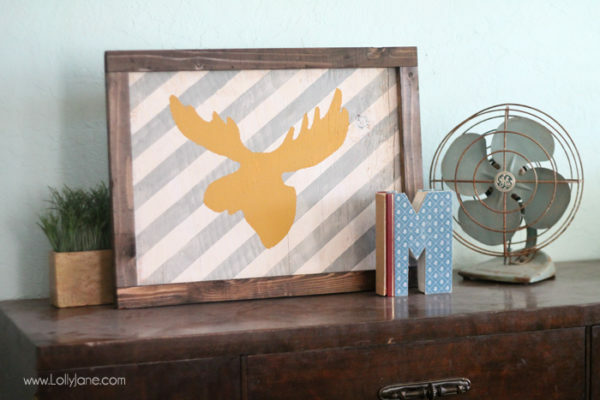 We’re back with a playful sign tutorial that looks professional but is easy to make! 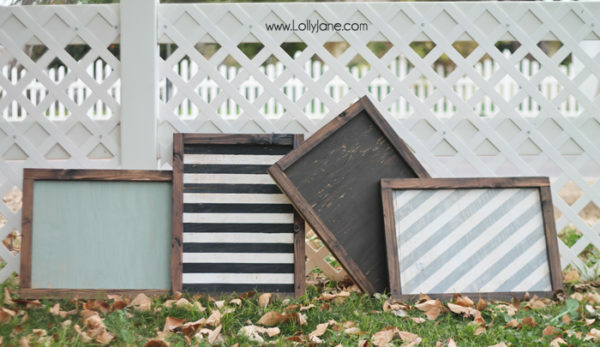 To get started, you’ll need 4 pieces of 2×1 (sized 16″ and 20″ long) and a piece of plywood (sized 16″x20″). We purchased a large sheet of plywood at our local home improvement store and had them cut it in thirds so we could get 4 signs from one sheet. 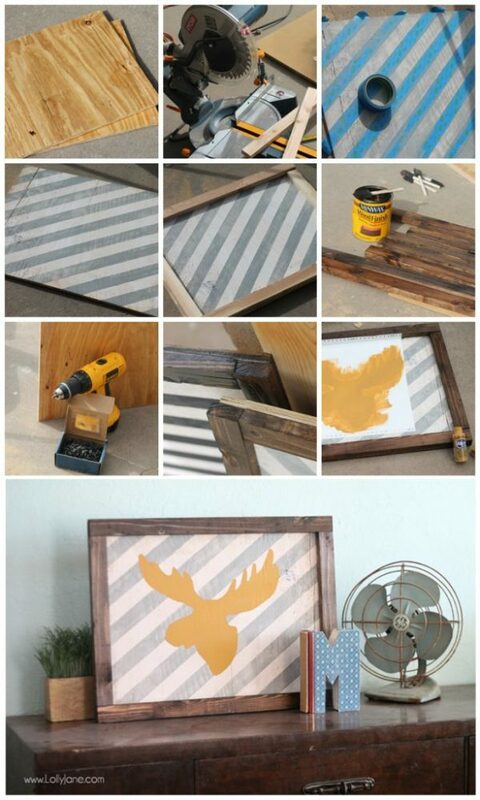 You will also need stain (black walnut) and acrylic paint (we used DecoArt’s Steel Gray, Cotton White and Mustard Seed.) Be sure to have a sander, 2″ painters tape and drill ready with 1″ screws. Stain your 4 pieces of 2×1 and let dry completely. Tape in a sideways pattern, 2″ apart until the board is covered. Paint over the tape in gray. Assemble the “frame” by screwing the 4 pieces of 2×1 onto the plywood, screwing from the back. 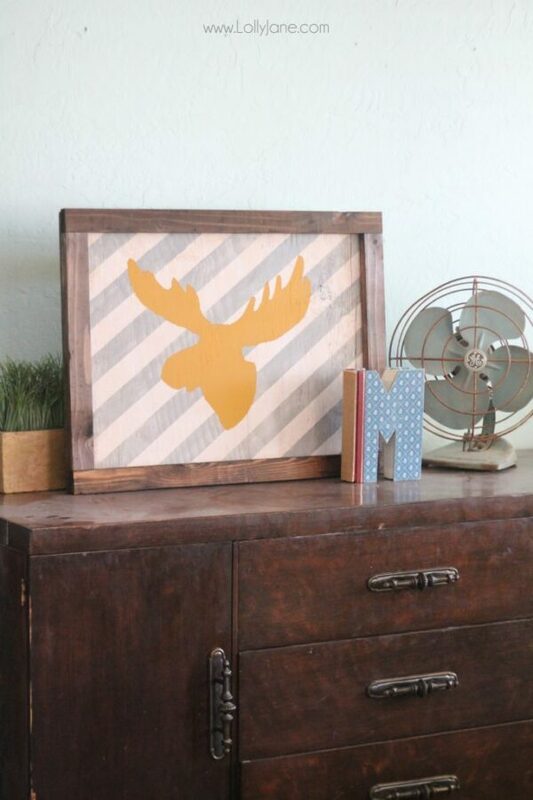 Cut a moose head stencil, (download here). Paint yellow and peel stencil. In the meantime, you can visit us on Facebook, Pinterest or our site for other great tutorials or pretty images to inspire you!